I absolutely cannot believe it's already February. What happened to January? Where did it go? Did I just imagine it? Somewhere between my crazy work schedule, Ryan's insane travel schedule, an ice storm, a round of the stomach flu, a political disaster, a birthday, a new website, a round of the regular flu and a preschool discipline problem, it turned into February without me even realizing it. I guess that's what happens when you're sleep deprived, living on pizza rolls and desperately waiting for the neighbor girls to finally deliver those Girl Scout cookies you ordered ages ago! Come on already...I need Samoas in my life. Anyway, here it is February and so it's time to start thinking of all thing Valentine's Day! While I can't say I've ever been a huge fan of Valentine's Day pre-kids, over the last few years it has been really fun to do little things with them that teach them about love and kindness. We also have some fun Valentine's Day traditions that we've started and continue to do. Every year on Valentine's Day we make our friend Dorothy's famous Pink Cake with strawberry buttercream icing. This year I might switch it up and try it with a chocolate cake mix and raspberries! I like to get crazy like that sometimes. We also had a little Valentine's Day photo shoot and made a cute photo card to send to family. This year's photos were not nearly as good as last year's photos (or the year before), because the kids were both snotty disgusting messes with bedhead and attitudes, but I still love it! I ordered a super cute Valentine's Day photo card from Minted that I'll post later, along with all of the hilarious outtakes of Mim crying and zoned out and Mac scowling and begging for candy. Typical. But she's sporting one of her very first-ever ponytails and I just about died of cuteness. This year I started the tradition of leaving the kids little hearts on their door every day with compliments or something I love about them written on it. Mac's hearts say things like, "You're an amazing fisherman. I love your laugh. You are a wonderful helper." Mim's say things like, "You take the best naps. I love your hugs. Best booty shaker ever!" I'm also planning on doing some random acts of kindness with them next weekend - we always do a few of these over Christmas and they're a big hit with the kids. I think the entire world could use some extra love and kindness right now, so I'm looking for ideas, if you have any. We also participate in a Valentine's Day card exchange with a bunch of other bloggers, where we make and exchange valentines. Last year we made Valentine's Day counting printables that you could play with candy conversation hearts and watercolor valentines. The year before that we made DIY tissue paper suncatcher hearts to hang in the window. And three years ago, when Mac was a tiny little thing, he and I made heart pennant banners to send to our friends. Mac also gets to give out valentines cards at school, which he's super excited about. 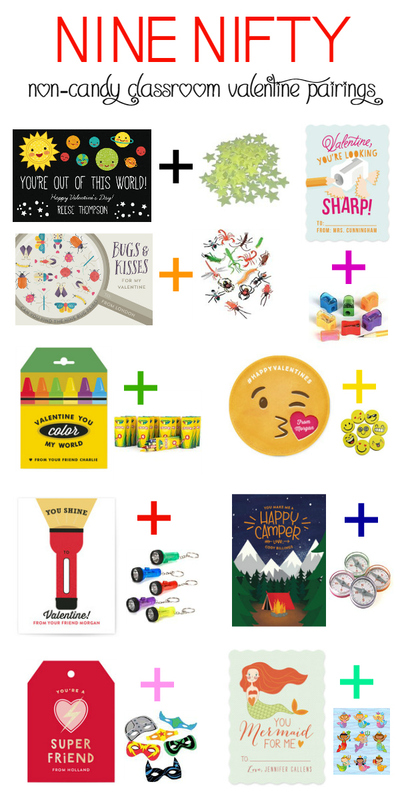 I would have loved to make our own valentines this year, however, we just ran out of time (and energy and focus and everything else), so instead, I picked out a couple of my favorite options of classroom valentines from Minted and put together some fun non-candy (per school rules) ideas of little trickets to give with our classroom cards. I showed Mac all the options and let him pick which card he wanted. He chose this really cute "YOU'RE OUT OF THIS WORLD" space valentine card, with matching stickers. We paired it with some fun glow-in-the-dark stars and voila! Instant (and super awesome, if I do say so myself) valentine! The classroom valentines from Minted are adorable. They're tiny, so they're not for mailing, but they're the perfect size for little hands and a tiny little treat/gift. I bought 2 different packs of glow-in-the-dark stars (here and here) and put a few in a cellophane bag. Closed the bag with a cute personalized planet sticker and stapled it to the card. Mission accomplished. Mac and I both love the way these turned out. I think the stars are a fun gift that his classmates will really like. Actually, I really liked all of the ideas that I had this year so I thought I might as well share them with you in case you're looking for ideas. So, if you're more of an Amazon Prime type mom than a Pinterest mom, you're going to love these! All of the cards are from Minted and all of the little trinkets can be purchased in bulk (very cheap) from Amazon. Done and done. Do your kids do classroom Valentines? Those valentines are adorable! Cam and I are making Lego valentines and he's all pumped. I need to go to Hobby Lobby and get materials. So cute! I went the non-candy route too and did Emoji stickers and bracelets from Oriental Trading! Super cute!! Lots of great ideas! The glow in the dark stars are brilliant (ha, see what I did there)!! I refuse to believe that Mac is not your child's name. But for reals I cannot wait to pass out Valentines! STOP. How do you have time come up with these?!! I'm obsessed... and if I was a kid, I would LOVE to get those glow in the dark stars. Totally my jam. LOVE. IT.